Cathedral Trail along the highway to Port Alberni on Vancouver Island is home to this giant Douglas Fir identified as being approximately 800 years old. 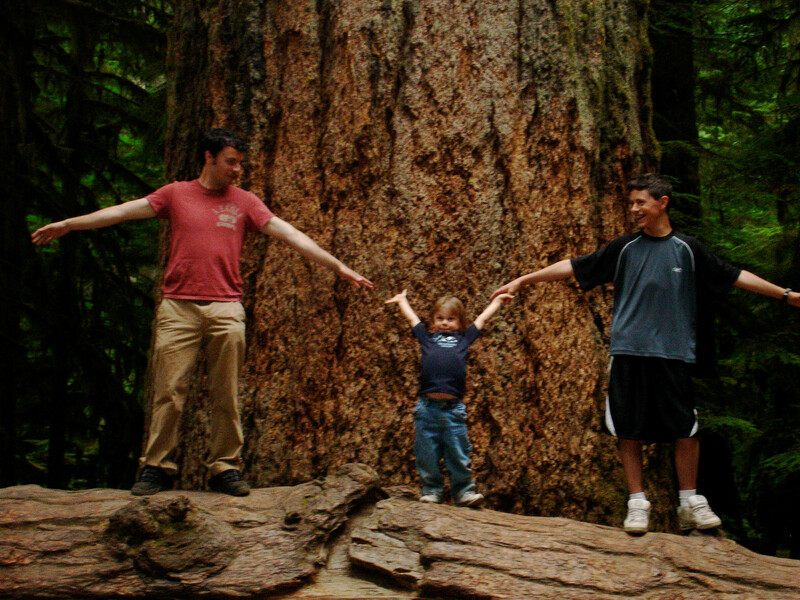 My oldest and youngest sons and my grandson illustrate just how huge the base of this giant of nature is, as the giant used to say…”look up….look way up”. A wise man (Sterling W. Sill) once suggested that we look around us and build our own hall of fame. Find the giants in our own lives, people who inspire us to look up and reach beyond what we might have previously thought we were capable of achieving. In that hall of fame we’ll have imperfect people, that’s pretty much a guarantee, but the trick is to find the best things about those individuals and focus on those attributes drawing what we can into our own lives as we reflect upon how we might personally improve. It’s pretty easy to focus on the flaws, and there is something to learn from others mistakes for certain, but the idea is to look around and find what it is that inspires you – perhaps the courage of an individual facing a critical illness, my friend Doug who passed away with ALS inspires me every time I think of him, or the coach who saw more in you than you saw in yourself (thank you Coach Anderson), your parents, a couple of students who want to make a difference in the world, a mom who time and time again shows outstanding patience and love with her children, a brother who works out like a demon (Randy) it doesn’t have to be complicated but write it down. Yes you can start with some pretty famous people – I have Lincoln, John and Bobby Kennedy, Gandhi, Martin Luther King Jr., and Jesus Christ, on my list but I also have young people like my former students like Brendan Hubbard and Kase de Vries and former players like Jeff Halvorson and Brian Ridgeway (come to think of it Kase and Brendan are former players too but you get the idea) . Find your giants, draw what you can from them and in the process there is a kind of synergy that allows for growth of everyone in the process. Something tells me if we spent a little more time finding the giant in each other there would be just a little less tearing down in society.